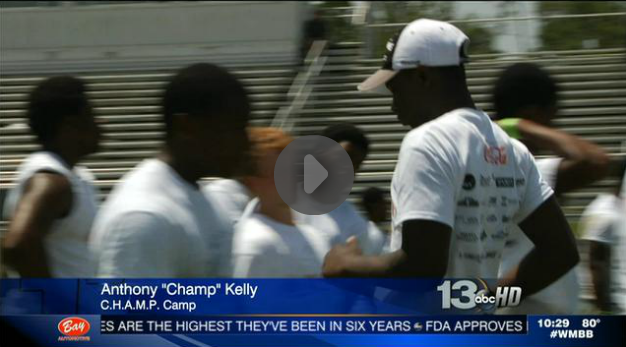 For the fifth straight year, Graceville graduate Anthony “Champ” Kelly returned to the Panhandle for his annual C.H.A.M.P. Camp, and the second and final day wrapped up on Saturday, with record numbers participating. Close to 300 kids from 10-18 took part in this year’s camp, receiving one on one instruction from former collegiate and even professional players. Several of Champ’s former teammates at Graceville and at Kentucky also make the trip every year to help out with the camp, and not one of them gets paid for their time, and Champ grateful for everyone’s hard work in making his dream a reality. Those high caliber guys agree it’s a no brainier to help Champ year after year. Helping him back is what keeps C.H.A.M.P. Camp going year after year. Each coach is unpaid, and each wants to better the kids. A future that’s showing in the coaches, like Kobe, or Will Witherspoon, a 12 year NFL veteran who’s giving back to the community that helped raise him. “Anytime I get to come home and do something like this, where I get to enjoy being at home, and being part of the community, and enjoy having fun with kids really and teaching them life lessons that I’ve learned, and trying to make sure they don’t make any mistakes along the way,” Witherspoon said. Guys like that, and guys like Champ, who keeps people coming back around.